Table Lamp Alabaster, white alabaster and beige shade 22 H x 12 W Feature the natural beauty of pure Alabaster? Handcrafted by Spanish Artisans Takes a max. 50-100-150 watt Type A bulb, not included This Pillar Table lamp crafted out of Alabaster quarried and hand-crafted in Spain measures 22 in. high and 12 in. wide with a 4 1/4 in. diameter base. 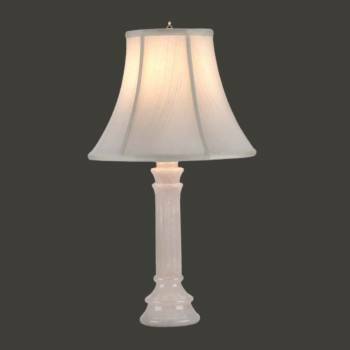 Beige shade measures 12 in. wide x 9 1/2 in. high with a top diameter of 6 1/4 in.